Tesla used female focus groups to engineer the Model X with features designed to appeal to women. Although the new Tesla Model X is a gender-neutral vehicle, the electric vehicle automaker seems to be marketing the crossover SUV exclusively to women. Gender-oriented advertising is not uncommon, whether it’s a luxury car commercial featuring supermodels or a minivan ad featuring a mother and her kids, but most automakers still use non- gender specific terms when describing the vehicle. Despite this fact, Tesla has decided to associate the Model X with female drivers. “Third-row access is finally easy. Even with child seats installed, the second-row seats slide all the way forward. Open Falcon Wings let you stand all the way up as you get in and out. Kids no longer leap and tumble over the second row, and adults find the third-row seats as accessible as the passenger seat." Aside from seating access, the Model X’s “Falcon Wing” passenger doors are perhaps its most impressive feature. The unique passenger doors possess hinges designed to open upward, rather typical minivan sliding doors. Although Tesla’s innovative design team created the Model X, they did have some outside help. In order to gauge the female psyche, Tesla decided to run numerous test groups with women to discover their likes and dislikes. "The focus group was great because it validated a lot of our own thinking," said Franz von Holzhausen, Tesla's chief designer. "Women don't want an overly feminine vehicle; they want to feel secure. But it has to be aggressive enough for a guy to feel confident, as well. We didn't want to make a Hello Kitty edition." He also drew on some personal experience when designing the Model X: "My sister has kids, including two in baby seats, and she drives a minivan," said von Holzhausen. "I had to climb over the car seats to get into the back seat, and it seemed ridiculous to have to do gymnastics to get in and out of the car." 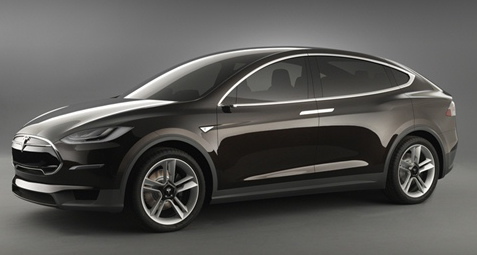 Tesla currently plans on launching the Tesla Model X by 2014. A prototype was recently unveiled at Tesla’s design studio in Los Angeles. Pricing has not been announced, but the Model X is expected to qualify for a $7,500 federal tax credit. MercuryNews.com reports that there are currently over 500 reservations for the upcoming Model X, which primarily includes women purchasing the vehicle for themselves and men buying it for their wives. For those you wish to reserve a Tesla Model X, get ready to fork over some serious money. Reserving the base model costs $5,000, while the Signature Edition will set drivers back $40,000.